Till recently, it has been awhile since we’ve seen blue skies. Caused by forest fires in Indonesia, the recent haze affecting Singapore and neighbouring countries in the region, in spite of seeing erratic periods of improvement and deterioration, has been a persistent annoyance to many of us. Undoubtedly, wearing oddly-shaped N95 masks may be a nuisance (in addition to being somewhat of a fashion disaster) as is walking around in open spaces with a faint whiff of burning vegetation and ash wafting in the air. The haze has affected the lives of us all and is likely to persist till the end of this year. However, while it is understandable for some to view the haze as merely an irritant or a ‘respiratory disease catalyst’, this incident has proved rather interesting, especially considering the multitude of reactions we’ve seen from different groups of people in response. This irksome event has brought out the best and most intriguing amongst us, but that’s not to say it hasn’t brought along a fair share of annoyed Singaporeans. Perhaps the reaction we’d would be most familiar with would be those of our own and our peers. The haze occurred during the hectic promotional examination preparation period for the Y5s and did happen to be somewhat of a disturbance. The day before the economics examination, speculation was abound about whether the examination would be postponed with some hoping for such a decision to be made (quite surely to be able to squeeze a few extra days of preparation) and others praying for the contrary, simply hoping for the papers to be over as quickly as possible. It was also a common and rather comical sight to see students running with jackets pressed to their faces from one examination venue to another. 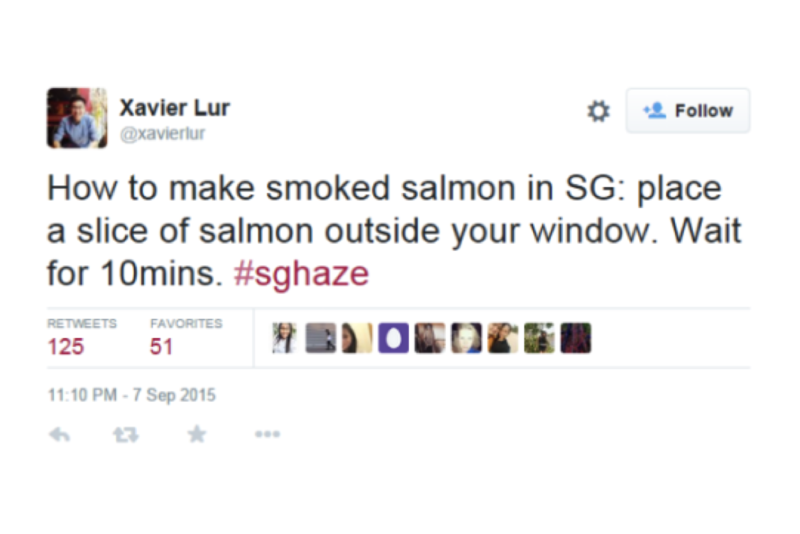 The haze also served as a prime stimulant for the creative, humorous sides of many Singaporeans. 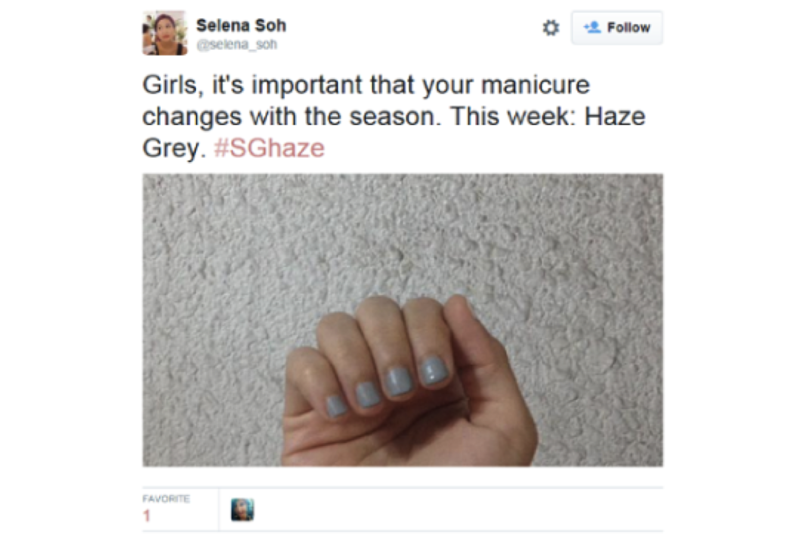 On Twitter, the hashtag #sghaze was trending, with many users capitalising on the haze to post chucklesome tweets commenting about the event. 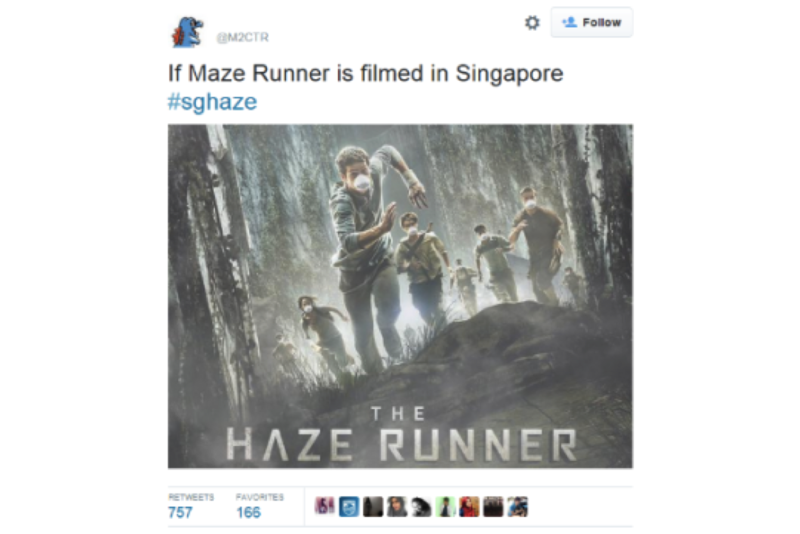 Twitter users take a jab at the hazy conditions. Yet, while these rather light-hearted takes towards the haze, which had become a rather concerning issue to many, was very refreshing, these attitudes also received a significant amount of flak by some social media users. A common criticism was that many people, especially students lamenting the fact that their schools were not closed, were too caught up with their own relatively trivial issues and not sparing a thought for the more pressing situations faced by others in other countries in the region. Whereas the PSI in Singapore which reached a peak of 442, was sufficient to incite a flurry of rage, frustration and general dissatisfaction towards Indonesian officials, reports soon emerged of even worse situations in various parts of Indonesia, where the PSI reached levels above 2000. The problem was further compounded by the fact that many rural Indonesian villages — even those closest to the “hot zones” — did not provide N95 masks, nor could many afford it. In light of this, it is easy to see how some of our responses of dissent and lamentations could be seen as rather trivial, especially relative to the realities of the situations in other countries in the region. Knowing the far worse plights of others in region, would it be be appropriate to place such an overwhelming focus on our own relatively trivial problems, instead of finding a way to help those in far more pressing need? Reports have shown that volunteers braved the haze to partake in mask distribution efforts in community centres all over the island, distributing over 60,000 masks to more than 10,000 needy elderly and households. In an even more altruistic and solicitous act of compassion, Ms Cheryl Lie, founder of the campaign “Let’s Help Kalimantan”, and three members of local NGO Relief.sg, including its CEO Jonathan How, flew to the Kalimantan region, which has seen PSI levels hitting over 1,900, collaborating with two Indonesian NGOs to distribute N95 masks and educate residents on how to use them. It is also rather heartwarming to know that similar deeds of goodwill have been conducted by many of our students, with numerous students volunteering in the nationwide efforts to distribute N95 masks to the elderly and the needy. Some groups of students have also been seen going around the campus distributing masks and bottles of herbal tea to the janitors and staff in our campus on their own accord. These actions show us that simple gestures and acts of compassion in the interest of others are not that much more difficult to carry out than posting a disgruntled tweet about our pitious fates in having to lug our tired bodies to school, and can go a long way in improving the lives of those around significantly, especially in such a time of need. In all, the haze brought out many sides of us all. With studies showing that such episodes are likely to recur and even intensify in the year, perhaps it is about time we start to think about how to prepare ourselves for similar events in future and also how we plan to react to this situations. Sure it does help to be positive and to take a light-hearted approach towards such a bothersome occurrence, but I think it is of greater importance that we reflect upon how we ourselves have reacted to the haze episode this year. Did we consider those more adversely affected than ourselves? DId we just bemoan our plights, having to come to school in spite of the asphyxiating smog? Or did we crack witty jokes and puns to bring a slightly more jocund take to the atmosphere? Neither of these reactions are wrong, but it would be ideal to attain a balance; concern for ourselves, concern for others and of course, a slight laugh to keep our spirits up in such arid times. Perhaps the next time such an episode comes around, we could spare a slight thought for those less fortunate than our (literally) sheltered selves, and how simple acts of kindness go a long way in making hazy days brighter for everybody, even if just a little bit.